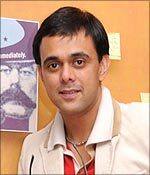 Star One's a new comedy show Paani Puri will see Sumeet Raghavan return to television after a gap of two years. Tell us about your role in Paani Puri. I play Vikas Puri, who falls in love with Divya Paani, a girl belonging to an upper class family. The story is of a couple whose respective families have tough time adjusting with each other when they live under one roof. My character is a guy who gets into trouble wherever he goes. I decided to do this show because it has been a long time since I was in television. Plus, the concept is interesting and it's a weekly show. I love doing comedy. It comes naturally to me. A good comedy is a blend of sensible acting and sensible script. Everything was right for me. Viewers still miss Sarabhai v/s Sarabhai. Any plans of bringing it back? You must ask the director or the producer. Like they say great work cannot be repeated again. When the show started nobody thought that it would be such a big hit. It worked because everything fell in right place. Do you think people will start comparing your new role with the role in Sarabhai v/s Sarabhai? It wrong to compare two shows. It's like comparing jam and butter. My character in Paani Puri is different from the one in Sarabhai v/s Sarabhai. When viewers watch the show they will come to know that both characters are different. I can relate to this character to some extent but not fully because I don't get into trouble wherever I go unlike Vikas. I am really having fun playing this role. We have not seen you doing any saas-bahu soap or daily shows. Comment. I am not comfortable doing saas-bahu or daily soaps. I don't think I will fit into any of them. I enjoy working for a weekly show. Your take on saas-bahu soaps? It's working for the channel and the industry. A lot of people are employed because of these soaps. People are watching the soaps and enjoying it. Who am I to question that? You previous shows Resham Dankh and Akela didn't do well. Any regrets doing these shows? All of us had put in lot of effort but sometimes it doesn't work. It could be because it lacked the presentation. I regret doing Akela where I played a ghost. I felt it was a bad show and everything went out of focus and it didn't click. You participated in two musical reality shows and was the winner of Shava Shava (musical show). Any plans of singing as a career? It is too early to talk about the future. Are you open to more reality shows? Yes, I would love to do a musical reality show. I am also keen on hosting reality shows. A big NO to Bigg Boss, I am not comfortable doing such shows. I am going to concentrate on Paani Puri for the next six months. Catch Paani Puri every Saturday at 9pm on Star One.